VantageLink allows you to admit/discharge patients, maintain patient records, place new drug orders & refills, and print medical records. Choose your region below and log in. or contact us to learn how you can become a VantageLink member. At UVANTA, more than anything, we are about building relationships that deliver results. We first seek to understand your unique needs, expectations, concerns, and challenges that you face everyday. Your local UVANTA Pharmacy operates as an extension of your facility. This is accomplished by providing personalized care and service that is driven by understanding your needs and aligning our service to meet those needs. That’s why our medication packaging, dispensing, and delivery systems are tailored to your requirements. They are designed to prevent medication errors, reduce costs, and save nursing time. Our medication packaging systems meet all industry standards for safety and efficiency. Medications are packaged in easy-to-use unit dose systems designed to promote quick availability and dispensing accuracy. Standard packaging options include: unit dose, unit-of-use, and multi-dose systems. Our innovative and flexible automated packaging system, VantagePAQ™, offers pouch-style packaging that is available only at participating pharmacies. We accept telephone, fax, or online orders via our VantageLINK™ system. 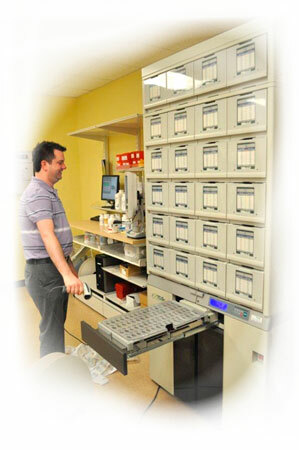 Medications are dispensed following a rigorous quality check and verification system to assure dispensing accuracy. A full line of pharmaceutical products are available, including: oral solids, injectables, intravenous, narcotic, and over-the-counter medications. Secure and proper handling, documentation, and safety measures are taken to assure DEA compliance in the accurate dispensing and tracking of all controlled substances. Our routine deliveries are timely, accurate and meet customer defined specifications. Dispensing and delivery status can be checked online via our VantageLINK system. Delivery personnel are courteous and trained professionals. 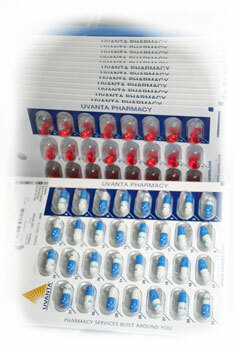 UVANTA Pharmacies will provide prompt delivery of all emergency medications requested by your facility. Emergency deliveries will be dispensed by UVANTA Pharmacy, or by an approved back-up pharmacy, to assure quick delivery to your facility. UVANTA has a national network of back-up pharmacies to provide prompt delivery of medications as needed. Pharmacist available 24/7 to answer questions, address concerns, and arrange for prompt delivery of needed medications. To learn more about our specialized packaging, dispensing systems and delivery services, please contact your local UVANTA Pharmacy.